Nedlands, W.A. : University of Western Australia Press, 1972. ”Mr. Warner in his Adirondack story, shot a bear by aiming, not at his eye or heart, but at him “generally”. But we cannot aim “generally” at the universe, or if we do, we will miss our game”. So said William James, the philosopher, and it is good advice on how to take aim at environmental problems. 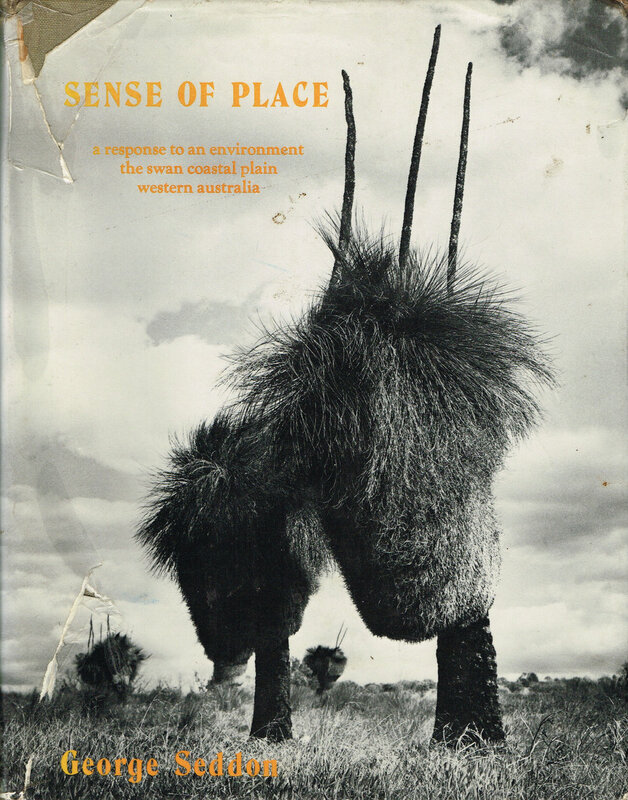 Sense of Place is a topographic essay, not on the universe, but the environs of Perth, Western Australia. It is in three parts: The Land - The Plants - Man. The landforms, climate, drainage geology and plant-cover are discussed in detail, to construct a picture of the region before European settlement. The last third deals with the land use by Aboriginal and European, and the major environmental resources of the region. So much has been impressed so quickly on what was nearly empty page a century and a half ago that this account if a remote settlement offers a case-history of the impact of Western technology on an empty land. It also raises, in acute form, questions about the permanent carrying capacity of this land. A topographic essay on the Perth region; p.186-197; Aboriginal & European land use - early hostilities between Aborigines & Europeans the result of mutual incomprehension (cites Yagan as example), gives map of tribal territory (1832), early population estimates, describes Aboriginal use of fire for land clearance, intrusion of Europeans & agriculture. "... originally published by the University of Western Australia Press, Perth, 1972. This edition is produced by permission of UWA Press and Professor George Seddon." xv, 274 p. : ill. (some col.), maps ; 31 cm. Botany -- Western Australia -- Perth District. Geographical perception -- Western Australia -- Swan Coastal Plain. Ecology -- Western Australia -- Perth District. Botany -- Western Australia -- Swan River Region. Physical geography -- Western Australia -- Swan River Region. Coastal plains -- Western Australia -- Swan River Region. Physical geography -- Swan Coastal Plain, Western Australia. Botany -- Swan Coastal Plain, Western Australia. Land settlement -- Western Australia -- Perth District. Physical geography -- Western Australia -- Swan Coastal Plain. Botany -- Western Australia -- Swan Coastal Plain. Economic sectors - Agriculture and horticulture. Settlement and contacts - Colonisation - 1788-1850. Environment - Land management - Fire. Land settlement -- Perth district. Human geography -- Western Australia -- Swan River Valley. Geology -- Western Australia -- Perth region. Botany -- Western Australia -- Perth region. Ecology -- Western Australia -- Perth region. Land settlement -- Western Australia -- Perth Region. Geology -- Western Australia -- Perth Basin. Swan Coastal Plain, Western Australia. Western Australia -- Swan Coastal Plain. Western Australia. Perth Basin. Geology. Ecology. Effect of land use. Western Australia. Perth region. Native plants. Western Australia. Perth region.